Description: This is a story about three smart, successful people who were once fast friends in college and have now been thrust together again in an unlikely, multi-layered investigation with far-reaching international implications and billions of dollars at stake. One is a forensic accountant for the SEC, one beta tests hardware and software for the US Department of Defense and the UK Ministry of Defense, and the third is a wildly successful entrepreneur, software developer and venture capitalist in Silicon Valley. This book promised so much in the description but it could not hold my interest. In all honesty, I still have a few pages left in this because I very easily put it down over and over again and occasionally it put me to sleep. :( In theory, I loved the sound of this book. I liked the forensic accounting angle; I liked the hints of wrong doing or shadiness that lurked around the edges. It just was missing that HUMPTH to keep me hooked. I think it was most definitely the writing style because the plot was entertaining. My favorite parts probably centered around Fitz and Charles. It was interesting watching their past play out as they reconnected after many years apart. I will say the characters all had distinct personality traits so it wasn’t hard to keep all of the many different characters separate. It did seem very shocking to me that Fitz and Charles relationship so easily ended back when it did under the circumstances it did as it played out. One of those annoying, are you serious moments of books where I wonder if that ever happens in real life. Overall, I think it just had too much going on and not enough humpth to grab me. How would you feel about working with a past spouse/lover on a case? I received this book from iRead Book Tours. All thoughts and opinions are my own. Still going strong! I'm super stoked that not only am I doing it every day I haven't even had to FORCE FORCE myself yet. But it has to be a priority and so something goes. So it's usually been reading or the blog so that's not good. I still maintain if I had a way to work out before I had to get my child from daycare life would be easier. Thankfully, she likes 'working out' with us and it has been a nightly family activity. But seriously, CAN I DO ANYTHING ALONE??? 1.5 miles, I also did some intervals with jumping jacks, my step, and 40 crunches.. legs were super heavy! I am pumped! 15 days in a row. I am loving my fitbit. It's helped me keep moving and get up and walk around a lot more at night time which is usually my fall into the chair exhausted time.I've also not been as exhausted so there is that! I've only noticed 1 pound gone on the scale so that has been slightly discouraging but I feel like my bloat is maybe a bit better? I need to drink more water though, I do know that. It's hard because I just don't drink. It's not like I'm drinking bad things, I'm just not drinking. I did drink over 70 ounces of water yesterday but usually I'm at about 40ish and 2 cups of coffee. I just need to make sure I keep drinking throughout the day. What work outs did you do this week? Do you have a fitbit? What keeps you motivated? Since I have yet to order my 2015 calendar even though I have a 9 dollar groupon (yikes, January is half over!) I have yet to start my monthly meal plan. Plus, I got out of habit at the end of December and I need routine or all hell breaks lose. So I've been doing weekly meal plans and thankfully I have built back up our pantry supplies and our freezer so it makes it easier! This was awesome! I found a paleo recipe for it and then adjusted it just a tad based on what we had available and what would make sense to pick up at the store for the future! What is on your meal plan this week? I intentionally tried to incorporate more vegetables in our dinners this week. My breakfasts will be either half a bagel w/ orange or apple or oatmeal with pb. Lunches will be salads and orange or apple or hard boiled egg with fruit and veggies. I may take a can of chicken noodle soup one day. Amber, and my new fitbit motivated me to take on a #mileaday challenge for January. I had a physical in December and sad to say, work stress is making not so good things happen with parts of my health. And my own doing of course but a lot I blame on work. So, I am determined to do anything I can to fix that. So I figured my first step is to use my fitbit, make sure i'm aiming for 10,000 steps a day AT LEAST and do at least one mile per day. I know I need to start slow because I know me and I know how many times I've fizzled when I've attempted to make working out a normal occurrence in my life. Nine days into January and I feel like I'm rocking it. Isla joins me every night and we go downstairs. I go on the treadmill and she uses my step or exercises ball or dances or plays. Her newest thing is making her dad come with us. So we are all working out as a family. Watching her do her crunches is hysterical!! I've also made over 10,000 steps every week day so far. I am now knowing WHY my feet kill at the end of the day. Essh. I am going to need to get new running shoes soon! So yeah, I've only done the treadmill part but slow and steady. I am determined and I want to run a mile straight with out stopping. I've been using intervals and I've even gotten better at those as the week goes on. My mile time has definitely improved! In February, I am going to try to work in one workout class a week and do another challenge. I'm debating between two different 28 day challenges I've found and incorporating some treadmill time in there too. Do you have any goals for January? Have you been running inside or outside? Do you own a treadmill? Do you do any treadmill workouts to change things up? 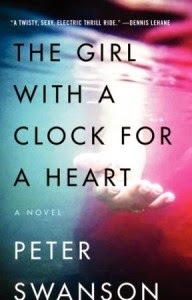 Wow, The Girl With a Clock for a Heart, definitely turned into something more than I thought after the first bit. George Foss is a single man in his early 40s who lives a very predictable life. He does the same things, works the same job, drives the same cars, is on and off with the same woman, he’s stable and predictable. Liana Decter is anything but the same. They met as freshmen at Mather College and fell into a young love together. A love that George has held onto for 20 years, even though she disappeared and he knew she was trouble. When she reappeared magically at his favorite local bar, he accepts it and goes back to where they were, without any hard questions. The thing about George is that he’s reliable and gullible. He believes the best when he really should be leery. This book had many twists, many OHHH GEORGE moments and lots of suspense. It even ends in suspense. 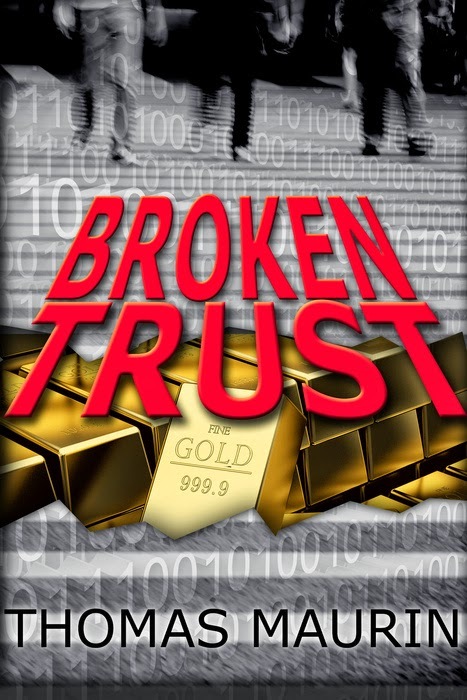 It’s a smart suspense book that keeps you hooked. I also enjoyed that it goes back and forth from present time to 20 years ago in college so you slowly learn Liana and George’s whole story. The only nitpicking is that I felt tying the name of the book into the text was a little I don't want to say cheesy, but it didn't seem write the one time and I feel like at one point the author took the time to spell out the differences and the person they both were when his writing had already done that for him. But that is very nit picky but just something I thought as an afterthought. Description: George Foss never thought he'd see her again, but on a late-August night in Boston, there she is, in his local bar, Jack's Tavern. Do you think people change or do you think in the end they stay the same? Would you be willing to help out someone from your past who lied and you hadn't seen in 20 years? I received this book from TLC Tours. All thoughts and opinions are my own. Her Last Breath is the 4th book in the Kate Burkholder series by Linda Castillo. Like the other books in this series, I flew through this book in a day! I noticed that like other thriller series that I read, if I read too many in a row I get irritated and need to take a bit of break. There was absolutely nothing wrong with this storyline but I found descrepancies with the overall storyline and they called the suspect the dead husband's name at one point. I will say that the twist in this book is very very good. I was also pleased with the headway that John and Kate's relationship took. There relationship is as frustrating as the Morelli and Stephanie Plum relationship in that series. One step forward, 3 steps back. And stupid reasons. Kinda like when I wanted to shake Claire and Ethan in Blackberry Winter, these two could use a throttling or two even with their 'histories'. There were some questions still eft at the end of the book and have me itching to read the next book in the series. How many books have you read so far in 2015? Does the snow /cold weather usually mean more reading for you? I didn't spend as much time reading short no brainer thrillers in 2014 like I normally do so I started off 2015 making sure that wasn't going to be the case! Friday we stopped at the library to play with cousins and I decided to see if my library had finally gotten copies of Linda Castillo's Kate Burkholder series. To my delight they had all of her books except the most recent, so I grabbed Gone Missing and With Her Last Breathe. A goodreads search earlier also had informed me of a 4.5 book in the series Long Lost and I downloaded it on my kindle so I can officially say that I've read a book on my e-reader in 2015 as well. Look at me go! In Gone Missing, John contacts Kate for once and asks her to assist in a case with the BCI. There are been several Amish girls who've recently been abducted in the various areas and they want her Amish experience to help out. This was more thrilling than Breaking Silence and I flew through it in 6 hours. Once I get started, I can't stop! Description: Rumspringa is the time when Amish teens are allowed to experience life without the rules. It’s an exciting time of personal discovery and growth before committing to the church. But when a young teen disappears without a trace, the carefree fun comes to an abrupt and sinister end, and fear spreads through the community like a contagion. A missing child is a nightmare to all parents, and never more so than in the Amish community, where family ties run deep. When the search for the presumed runaway turns up a dead body, the case quickly becomes a murder investigation. And chief of Police Kate Burkholder knows that in order to solve this case she will have to call upon everything she has to give not only as a cop, but as a woman whose own Amish roots run deep. Kate and state agent, John Tomasetti, delve into the lives of the missing teen and discover links to cold cases that may go back years. But will Kate piece together all the parts of this sinister puzzle in time to save the missing teen and the Amish community from a devastating fate? Or will she find herself locked in a fight to the death with a merciless killer? I will say that it definitely surprised me in the whodunnit. I had my thoughts and they changed a few times but I think I figured out who did it about the same time as Kate this time. I liked how it ended because it made it possible for some of the characters to come back in the future. If you are into mystery/thrillers or interested in Amish life, this series is one you should check out! The books are usually just under 300 pages and you get sucked in quickly! Description: It’s autumn in Painters Mill, and Chief of Police Kate Burkholder and John Tomasetti are taking a much-needed vacation at a small bed and breakfast an hour outside of town. After closing a difficult case, they’re looking forward to some down time, but their relaxation is cut short by rumors that the old house where they’re staying is haunted by a girl who disappeared twenty years earlier, leaving nothing behind but some bloody clothes by the river and rumors of a volatile relationship. Swept up in the girl’s story, and a need for justice, Kate and John begin looking into the mysterious disappearance of Angela Blaine. They discover long-buried secrets—and unravel a mystery with an unexpected outcome. I will say that it was a quick and interesting mystery that they embarked on their weekend off. Castillo does not spend much time on their sexual relationship so it's a bit abrupt about their time at the B&B, but it did make me want to visit Amish country in the fall! Have you read any Amish books? I remember reading a series when I was younger staying with my grandparents in Ohio. I picked up books from the local library but the name of that series just won't come to me! Have you read any books set in Ohio? What's your favorite series? Blackberry Winter by Sarah Jio was the final book of 2014 for me. I read most of it on New Years Eve and hurried up to finish it that night (DORK , I KNOW!) to bump up my stat ha. It felt like the right way to end the year since I began the year reading 2 of her other books. Now I think I have only two more to catch up on and I'll have read them all, but I do want to re-read The Violets of March. I know I gave it to someone to read and now I want to read it again, #bookproblems ! Blackberry Winter, flips between present day Seattle and 1933 Seattle. At first it gave me a tad bit of anxiety because it dealt with a three year old boy that had disappeared. But I reminded myself that her books while steeped in sadness would not have had a horrible end for that poor boy so I plowed on. Like her other books I fell in love with the characters and loved the peek into the past that Vera's storyline offered. I loved reading about life in Seattle in the early 1930s and how she struggled to support her son. It was a unique insight into a time frame that really interests me. I didn't feel as connected to Claire, who was the present day main character. Like many times in books I feel I looked at her character and her husband's character and wanted to shake them both because of idiot actions on both parts. That's the chick lit part of her books that sometimes nags at me. Like her other books, I'd recommend this one in a heartbeat. However, be advised that if pregnancy loss or child kidnapping causes anxiety or are topics you need to avoid it may be best to stick to one of her others! I suggest starting with The Violets of March! Description: In 2011, Sarah Jio burst onto the fiction scene with two sensational novels--The Violets of March and The Bungalow. With Blackberry Winter--taking its title from a late-season, cold-weather phenomenon--Jio continues her rich exploration of the ways personal connections can transcend the boundaries of time. Did you read Blackberry Winter? What were your thoughts? 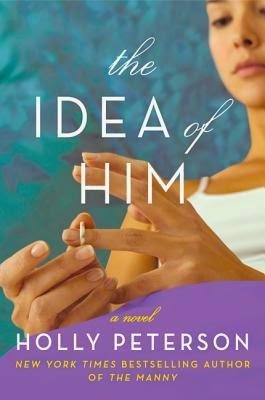 What is your favorite book by Jio? Any other books set in the 1930s you'd recommend? How many books from the library? 7 which is signficantly lower than last year's 25! How many books read did I purchase? 9 I bought new, 7 I got used from the library's book sales.. Which countries did you go to through the page in your year of reading? United States, Afghanistan, France, England, Mexico, Ireland, Yugoslavia, Germany and I think that is it.. I read a lot of books set in England this year! What was your best reading month? July! I read 10 books! What was your worst reading month? How many books did you read this year? What was a reading highlight? Best book? Worst book? Goal for 2015?